This post originally had nothing to do at all with wine. It has to do with the debate in my office about which is better: Al Wazir Chicken or Zankou Chicken. It also has to do with the fact that I’m eating Al Wazir as I type, which makes for good eatin’ and terrible typin’. But I’ve found that their chicken is lacking (gasp!). Their portions are small, the chicken is greasy, and the skin–the most important part!–is rubbery. It’s like eating a rubber chicken–a delicious one, but still, a rubber chicken. People love Zankou’s garlic sauce. I agree. It’s damned good. But even with their combination plates you don’t get rice pilaf! You only get pita and hummus and tomato and pickled turnips. And their standard 1/2 chicken plate is $7.98. Al Wazir is on the corner of Hollywood and Gower. They roast their chickens using the 2000-year-old “Al Wazir” method. A standard 1/2 chicken plate is $6.45 and includes hummus, salad, pickled turnips, AND rice pilaf. It’s enough for two people. But the most important part is the chicken itself. The skin is superb, crisp and crackling. The flesh is moist and tender. 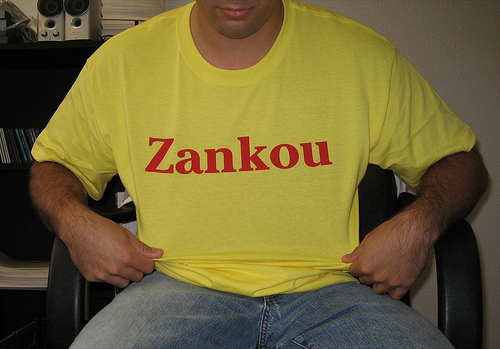 It’s obviously superior to Zankou, though most of the people at my office don’t agree. Now the connection with wine: Al Wazir, and maybe Zankou, is great with beaujolais nouveau–specifically, the Louis Tête mentioned in a previous post. Beaujolais nouveau is perhaps the lightest, most white-like red wine. It’s fruity, juicy, and meant to be gulped joyously. It’s refreshing and, the best thing, it gets you drunk. If you hurry, you might be able to find bottles of nouveau in stores–it’s a bit late for beaujolais nouveau, but I suspect that there are thousands of bottles sitting around, waiting for their moment in the sun.